The 30th anniversary Blu-ray 4 disc set comes in a great little book-like packaging with pictures and details of each disc. For the Ultimate Back To The Future fan this is a great holiday gift and one to be treasured. 2015 seems to be the year of Back To The Future, which appeared to hit it's frenzied peak at the end of October. From documentaries about the films to movie marathons in theaters across the country, the franchise has seen a resurgence in popularity. Cashing in on the frenzy, specialty items from Pepsi and USA today sold out in minutes and Universal Studios and Amblin Entertainments have released a 4 disc, 30th anniversary Blu-ray. Everyone knows the story of Marty McFly (Michael J. Fox; Spin City) and Doc Brown (Christopher Lloyd; A Million Way To Die In The West) and their time travelling machine made out of a DeLorean. In Back To The Future, Marty travels back to 1955, interfering in his parents first meeting, and almost altering history and his very existence. Spawning two sequels, the group then travels to October 21, 2015, and then, ultimately, back to 1855. Of course, the first of those dates popped up on our calendar this year and numerous celebrations heralded a new era of love for the series. The first three discs in the special edition Blu-ray are the movies themselves and hours of mostly previously released bonus material. Each one has deleted scenes, Tales from the future that range from the Physics of Back To The Future to The Test of Time, and behind the scenes material. The fourth disc is a brand new group of bonus features, including a 2015 message from Doc Brown and an insight into restoring the DeLorean. It also offers two episodes of the animated series and fake commercials for Jaws 19 and the hoverboard from Back To The Future II. These movies are video transfer, making them seem as if they are live camera shots instead of film. The 1080p High Definition shows great clarity and detail. The DTS-HD 5.1 audio is sharp and crisp. For a 1985 movie, this Blu-ray enhances the quality and makes an endearing, new classic come to life even more. So many times, director Robert Zemeckis (Tales From The Crypt) waxes nostalgic about how the original movie almost didn't get made. He regales audiences with the tales of being rejected by everyone, beside Steven Spielberg (Saving Private Ryan), until he made a successful film. Thankfully, the film did get made and has become an enduring testament to telling a great story in a fun, youthful way. The 30th anniversary Blu-ray 4 disc set comes in a great little book-like packaging with pictures and details of each disc. For the Ultimate Back To The Future fan, this is a great holiday gift and one to be treasured. Back To The Future was beloved when it first arrived in theaters, and, from the frenzy that was witnessed this past month, that love hasn't abated one bit. If you don't own the films, this is the perfect excuse to go out and buy them now. 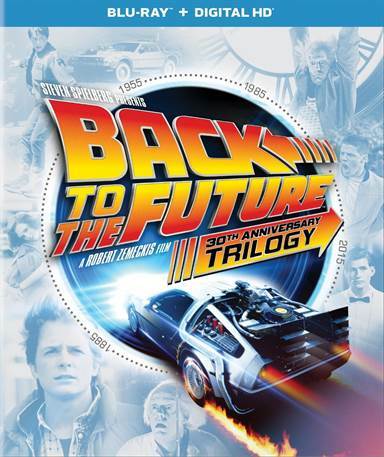 Download Back to the Future 30th Anniversary Trilogy from the iTunes Store in Digial HD. For more information about Back to the Future visit the FlickDirect Movie Database.